In Canada, Tim Horton's isn't just a coffee and donut shop, it's a way of life. Say Tim's or Timmy's and everyone knows exactly what you're talking about. I'm thrilled that there is one being built in my neighborhood. It's always a busy place, but the service is fast. If the videos don't work on your device (they didn't work on my ipad but did work on my desktop), try this link. You can see the yarn bombing on "B-roll Package" and on video on the street in Toronto if you choose "Other Video Resource" from the drop-down. 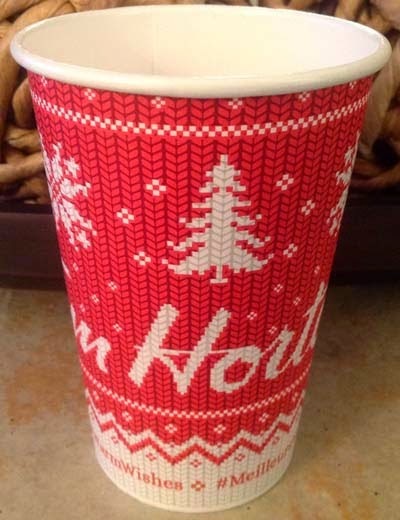 "Tim Hortons "yarn-bombs" its mobile coffee truck, the TimsRunner to celebrate the launch of Tim Hortons new #WarmWishes holiday cups and social media campaign encouraging Canadians to do good for others this holiday season. The TimsRunner "sweater", created by Toronto-based, Lettuce Knit, required a team of 35 knitters, 450 skeins of yarn, and nearly 1,000 hours of knitting time. Once the yarn is removed from the TimsRunner it will be washed, felted and repurposed into over 30 blankets to be donated to Covenant House." Click on the Lettuce Knit link (the November 20th post) to read about their participation in the project. I probably sound like a commercial for Tim's. but that's fine with me. They do a lot of good for communities. I hadn't heard about this - thanks for posting. So neat. I love the look of the new paper cup and really wish there was a ceramic version. It would be so cozy!